It’s no wonder that Dr. Amir Varshovi was recognized as the 2014 U.S. Small Business Administration (SBA) Small Business Person of the Year for the State of Florida. Along with his business partner, Marla Buchanan, Varshovi has demonstrated success in two areas that are critical to the growth of a strong national economy – expansion into international markets and development of sustainable green technology. Varshovi arrived in the United States from Iran in 1972 as an undergraduate student. The son of an English teacher, and a self-professed researcher by nature, he admits playing with chemistry sets when he was a little kid. He went on to complete his Ph.D. in soil and water science at the University of Florida. While working as a researcher, he hired Buchanan, then an undergraduate student, to work in the lab. They were an unlikely pair given Buchanan was a criminal justice major. Buchanan went on to law school and became a shareholder in a successful Jacksonville law firm, but the two kept in touch, and when the time was right, they began working together again to start Green Technologies. Varshovi and Buchanan first visited the Florida SBDC at the University of North Florida (UNF) in 1999 as attendees of the “How to Startup Your Own Business” and “Financing Your Business” workshops while starting Green Technologies. Since then, Varshovi has developed processes and patents for the production of environmentally sound and agronomically superior fertilizer products utilizing sustainable and renewable nutrients from the water treatment process. Green Technologies’ focus is on extracting and recycling nutrients from the municipal water treatment process and developing slow release fertilizers that are environmentally friendly and agronomically superior. 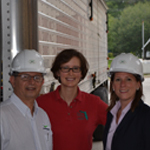 They partnered with JEA, which provides biomass from one of their plants, to begin production. The partnership allowed Green Technologies to manufacture fertilizer and JEA to recycle its waste responsibly. Years later, Varshovi and Buchanan returned to the FSBDC at UNF to explore opportunities in exporting Green Technologies’ fertilizer products. Through the State Trade and Export Promotion (STEP) grant, the FSBDC at UNF’s international trade specialist, Stacey Roussel, developed a comprehensive export marketing plan for Green Technologies. The plan was instrumental in the company’s international expansion. These invaluable resources included the U.S. Department of Commerce and Enterprise Florida, strong partners of the FSBDC at UNF. Varshovi participated in several Florida Trade Missions to South America through Enterprise Florida and the Governor’s office where he utilized the export marketing plan and other tools and resources from the FSBDC at UNF to expand Green Technologies’ export market. He traveled to Ecuador where he secured a deal with an Ecuadorian distributor to increase exports to $1 million for 2014. He recently participated in a Florida Trade Mission to the Dominican Republic. As a result of its increased sales overseas, Green Technologies has been able to add three additional new employees to support its growth in domestic and international markets. In 2012, Green Technologies purchased a 24 acre parcel of property in Lakeland, Florida to build a manufacturing facility as part of an expansion plan to include a private waste water treatment facility that can be utilized by public, private utilities and municipalities for advanced treatment of wastewater and organic bio solids. Varshovi and Buchanan returned to the FSBDC at UNF to meet with consultants Cathy Hagan and Robert Myers to develop a proposal to present to investors for potential funding of the facility. Using their business valuation tools and expertise, Hagan and Myers helped them understand how to calculate the value of the proposed plant as well as the existing revenue streams. Plans for the plant are well under way with the groundbreaking scheduled in 2014. The company has grown from one employee to ten employees since Varshovi and Buchanan began working with the FSBDC, with plans to add ten more employees in the next two years. They are now embarking on a branding strategy for Green Edge fertilizer with the assistance of the FSBDC at UNF who has connected them with a “brand strategist.” Varshovi and Buchanan have also tapped into the FSBDC’s government contracting expertise as they target more municipalities and utility companies to build more plants like the one coming in Lakeland. Varshovi recently traveled to Washington, D.C., where he was recognized among Small Business Person of the Year winners from all 50 states, the District of Columbia , Guam, and Puerto Rico at a special awards ceremony at the conclusion of National Small Business Week. "The FSBDC's guidance has helped Green Technologies grow substantially. We look forward to tapping into more resources as we continue to expand."